To ask Michael Dempsey questions, please sign up. [image error]Sincere thanks to all of you who participated in the NECROPOLIS Kindle Fire Giveaway! We had over 6500 entries! Winners will be contacted by email for mailing information. 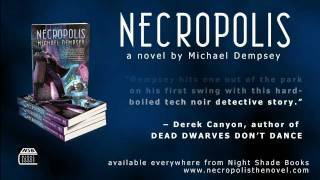 Description: the prologue from Michael Dempsey's NECROPOLIS, published by Night Shade Books. "Detective Noir meets Cyberpunk. Me likey. " We’d love your help. Let us know what’s wrong with this preview of Wytches, Volume 1 by Scott Snyder. We’d love your help. Let us know what’s wrong with this preview of The Cartel by Don Winslow. "a little disjointed at times, but a lot of fun." We’d love your help. Let us know what’s wrong with this preview of Factotum by Charles Bukowski. JANUARY SCIENCE FICTION: This poll decides which two books move on to the run-off poll for January 2012 SF Book of the Month. “If you leave me here," the guy on the floor said, "he'll kill me tomorrow morning." Hi, my new friend! thanks for accepting my friend request and for addition to my review! It seems we could exchange a lot of recommendations, tips, opinions in the future! Best wishes, Have a Happy New 2012 Year! Let the wonderful noise of the sea always sounds in your ears! (a greeting of the water dragons' hunters - my Tale Of The Rock Pieces). Thanks for seeking me out, Michael.